This month’s wallpaper was both awesome and a headache to pull off. It was great because I love October (and fall in general), and I’m (not-so) secretly a fan of all things dark, gothic and spooky. On the other hand, it was pretty annoying because of our dear friend iOS 7 and the introduction of parallax wallpapers. Much to my dismay, wallpapers that are the actual resolution of the phone (640 x 1136) are now distorted and artificially zoomed in on iOS 7, which means that all of my past wallpapers look like total garbage on my phone. Boohoo! So, all new wallpapers have to be made with a different resolution to fit properly. Thanks, Apple! Going forward I’ll be including two mobile sizes: one for iOS 7, and one for earlier versions of iOS. And, you know, other phones… but who uses other phones? Juuuuuuust kidding! Happy October, ladies and gents! 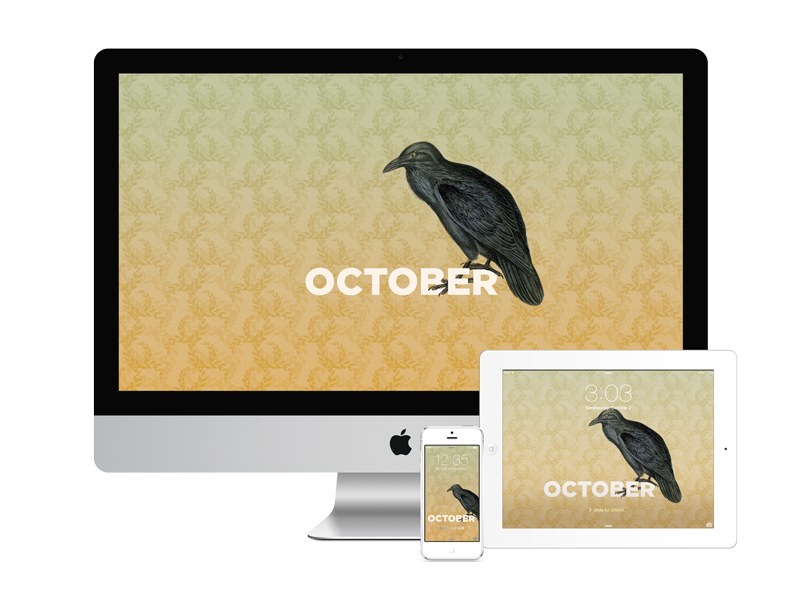 I adore this month’s wallpaper. Poe doesn’t get enough love in wallpaper form so I can say this is the first I’ve ever seen. Thanks for sharing!